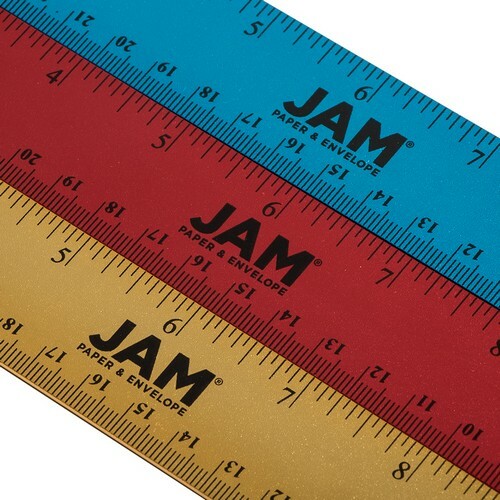 Rule the day with JAM Paper's Stainless Steel Rulers! With 12 inches of shimmering stainless steel, it's the last ruler you'll ever need for your workspace or school desk! These rulers feature pinpoint accurate centimeter and inch marks, so you can't blame the tools when you make a mistake! Use the straight edge of the ruler to draw lines more accurately than you ever thought possible. Perfect lines, perfect measurement. When not check out the largest selection of paper you'll find to go with your new shiny new ruler? Here at JAM, we have every color and size imaginable.